The IFLA Professional Reports series promotes high standards of library and information services and advances knowledge within the profession. Contents include guidance on implementing IFLA standards and guidelines, reports and articles on emerging trends in areas of professional practice, and substantial project reports. Professional reports are Open Access publications, licensed as Creative Commons Attribution 4.0 International (CC BY 4.0). This license permits the widest possible dissemination of Professional Reports to IFLA members and the library community. Professional reports are published under the guidance of the Professional Committee. Printed copies of the original language version are also available for purchase from IFLA Headquarters. Order directly from IFLA Headquarters (address on order form). Price per report: EUR 20 (unless otherwise noted). The Hague, IFLA Headquarters, 2009. - 34p. 30 cm. 2009. - 24 стр. 30 cm. The Hague, IFLA Headquarters, 2009. - 30p. 30 cm. 2008. - 65 стр. 30 см. La Haya, oficina central de la IFLA, 2009. – 50 p. 30 cm. Kay Ann Cassell, Sharon Johnson, Judith Mansfield, and Sha Li Zhang. The Hague, IFLA Headquarters, 2008. – 24p. 30 cm. Pat Muller, Ingrid Bon y Ivan Chew. 2008. – 23p. 30 cm. Pat Muller, Ingrid Bon et Ivan Chew. The Hague, IFLA Headquarters, 2008. – 23p. 30 cm. The Hague, IFLA Headquarters, 2008. – 60p. 30 cm. Alexandra Yarrow, Barbara Clubb and Jennifer-Lynn Draper. The Hague, IFLA Headquarters, 2008. – 53p. 30 cm. Coordinated by Pat Muller and Ivan Chew. The Hague, IFLA Headquarters, 2008. – 20p. 30 cm. Note: Our Libraries for Children and Young Adults Section has published a revised version outside of the Professional Reports series. Edited by Nancy Bolt and Suzanne Burge. The Hague, IFLA Headquarters, 2008. – 65p. 30 cm. Helle Arendrup Mortensen and Gyda Skat Nielsen. The Hague, IFLA Headquarters, 2007. – 20p. 30 cm. Les Recommandations sont un projet commun (2006-2007) à toutes les sections de la Division III de l'IFLA - Bibliothèques servant le grand public, et coordonné par les bibliothèques pour les enfants et adolescents. The Hague, IFLA Headquarters, 2007. - 27p. 30 cm. Pautas de servicios bibliotecarios para bebés e infantes Las Pautas están desarrolladas como un proyecto conjunto (2006-2007) de todas las secciones de la División III de IFLA.- Servicios bibliotecarios para todos los públicos, y coordinado por la Sección de Bibliotecas para Niños y Jóvenes. The Hague, IFLA Headquarters, 2007. - 26p. 30 cm. The Guidelines are developed as a joint project (2006-2007) of all sections of IFLA Division of Libraries Serving the General Public, and coordinated by the Libraries for Children and Young Adults Section. Vibeke Lehmann y Joanne Locke - traducido por Jenny Pérez Rodríguez. La Haya, IFLA Headquarters, 2007. - 24p. 30 cm. The Hague, IFLA, 2006.-63p. 30cm. La Haye, IFLA, 2005.-24p. 30cm. The Hague, IFLA Headquarters, 2006. - 63p. 30 cm. The Hague, IFLA Headquarters, 2006. - 29p. 30 cm. The Hague, IFLA Headquarters, 2006. - 19p. 30 cm. The Hague, IFLA Headquarters, 2005. - 24p. 30 cm. The Hague, IFLA Headquarters, 2005. - 28p. 30 cm. The Hague, IFLA Headquarters, 2005. - 67p. 30 cm. By Birgitta Irvall and Gyda Skat Nielsen. 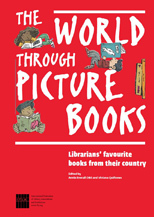 By Bruce Royan, Monika Cremer et al for the IFLA Audiovisual and Multimedia Section. Translation by Kirill Kolosov. 2005 The Hague, IFLA Headquarters. - 20p. 30 cm. By Bruce Royan, Monika Cremer et al for the IFLA Audiovisual and Multimedia Section. Translation by Gregory Miura. Deutsche Uebersetzung von Monika Cremer, Peter Franzke, Heinz Fuchs und Birgit Wiegandt. Rapport rédigé par un Groupe de Travail sous la responsabilité de Nancy Mary Panella dans le cadre de la Section des Bibliothèques desservant des publics défavorisés. By Maxine Rochester and Pertti Vakkari on behalf of IFLA's Library Theory and Research Section. By Gyda Skat Nielsen y Birgitta Irvall. Bajo los auspicios de la Sección de Bibliotecas al Servicio de Personas con Desventajas. Resource Guide on Access to and Interlending of Alternative Format Materials. Compiled by Richard N. Tucker, under the auspices of the IFLA Libraries for the Blind Section. By Gyda Skat Nielsen and Birgitta Irvall. Publié sous les auspices de la Section des Services de Bibliothèques pour les publics défavorisés. Earlier titles in this seres are out of print and not available for purchase. Please see our backlist [PDF] for full title details.